And, this post from March of last year: Bridging The Gap. You know what I’m about, and, you know for the most part that I nigh annoyingly positive, constructively inclined, and inherently optimistic. Rarely, do I flat out say something needs to stop. Well… today is one of those rare days. It isn’t just because there are, for the most part, daily online conversations about the tremendous student debt happening in the field of allied rehab therapy. It’s not just because I get regularly flooded by questions in my many inboxes on the matter of personal finance and career path. The reason we NEED to talk about the debt, isn’t even for the sake of student debt, itself. There will be no profession, if professionals cannot afford to practice. This is as much of a problem in the health of supply in new clinicians, as it is in the business practices en masse of our profession. If we have no supply, how can we suffice any demand…. not to mention, our historical desire to raise demand for Physical Therapists beyond the 7-10% marketshare for musculoskeletal health service delivery — a great segue to #2…! For far too long, Physical Therapists along with our allied rehab therapy colleagues have taken this curious “step back” in accepting our station as “ancillary services” to the “primary” services, that of physicians. We’ve been happy enough — at the very least, happy enough not to change anything. Still, when it comes to being at the mercy of referring medical offices versus aggressively going after the market — we do a lot of talking, and not much action. A market, mind you, which is WIDE OPEN. 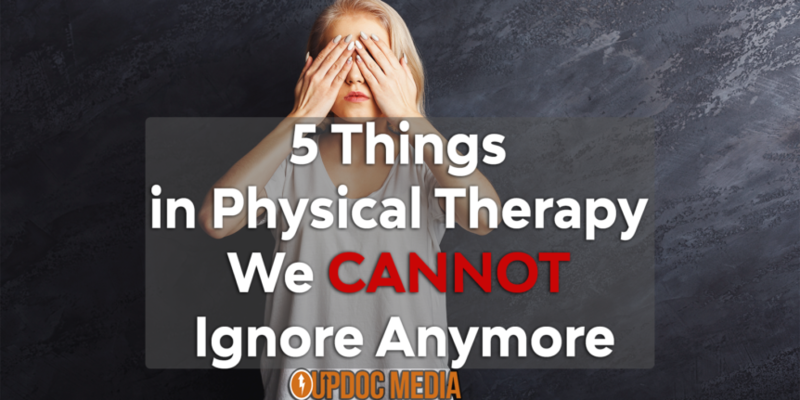 As mentioned, only 7-10% of the general population that medically qualifies to be seen by a Physical Therapist — ever does. AND, of that marketshare, the outpatient sector can boast a conservatively aged industry value estimate of $30 BILLION dollars [see here & here, “classic numbers”]. This attitude problem is furthered with so many practices “proud” of have a “zero marketing budget” or being 100% driven by referrals and word-of-mouth. What happens when referrals stop? What happens when people stop talk about your practice? What happens when the majority of healthcare consumers do what every other consumer group does… and, shifts their shopping behaviors online channels as they’ve ALREADY DONE?! This “we don’t need to market because the excellence of our care will market for us” needs to go away… FOREVER. Disney. Amazon. Apple. Google. Starbucks. Target. They are all pretty dang savvy at what they do. Do you see THEM bragging about their “zero marketing dollars spent?? ?” HELL NO! These industry giants don’t measure their marketing success by how much money they DIDN’T SPEND; they measure their marketing success by the Return On Investment (ROI) by scale to which they DID INDEED SPEND! AND, many times… the more they spent, the more they gained! Marketing isn’t a dirty word. Sales isn’t a dirty world. Public Relations isn’t a dirty word. Community Outreach isn’t a dirty word. Spending isn’t a dirty word. If any of the words above made you uncomfortable, as if it’s not part of the clinician’s role… then it represent a naive outlook that if we are good enough, people will support us. WRONG! If we share the message of WHY we are the best choice they’ve ever made for their lives and their well being… THEN they will support us — which then leads us to…! In the scope of physical therapy, we are a doctoring profession. That means Physical Therapists are doctoring providers; and, Physical Therapist Assistants are extenders of doctors. This isn’t about if we should be; this isn’t about how it came to be; this isn’t about how we should change; this isn’t even about how some of our colleagues missed the “D” in front of their “PT by mere months or handful of credit hours; this is about what is presently the situation for the Physical Therapy profession. And — we need to own this. HOWEVER, what we are trained to do is ultimately trumped by how we are LEGALLY allowed to practice. It doesn’t matter how great our training gets, how advanced our schooling gets, or how backed by science our methodologies are — if our LICENSE doesn’t reflect those knowledge & skill sets… our hands are tied. All these political and legislative battles are fought in another playing field — outside of the clinic walls, on top of another veritable treatment plinth. The victors of these battlefields are the true gatekeepers of supply. It is here, we must fight and win. Speaking of… have you heard of the PT PAC? Any ideas what they do? Honestly, I didn’t while I was in school… I barely understood the significant even three years post grad… and, only recently have I had in depth discussions with the PAC on what they do — and, how simple things like: how APTA membership dues and lobbying dollars come and go in different buckets. Confused? Angry? Feeling like your dues should somehow lead to advocacy dollars for lobbyists? Well….. it’s a different story in this battlefield and we must be AWARE of the weapons if we are to be strategically involved in actionable game plans. Tragically, this ever present lack of awareness to the importance, logistics, and flow of how advocacy works for our profession is crippling us. It’s beyond ridiculous to think a PROFESSION can care so little to act upon the very barriers and boundaries to which govern its ability to practice. Sadly, so much of this can be attributed to…! In the practice of physical therapy, clinicians are conditioned to be workers, not owners. You heard me, you read that correctly — Workers. And, regardless of if an individual professional is an equity owner or shareholder, it’s not so much about the title as much as it is the MINDSET. Our tendency as clinicians is to think and value only the clinical aspect of our profession — after all, someone else will take care of it, right? Someone else will do marketing, someone else will cover billing and coding, someone else will do training, someone else will surely take care of the political battles on Capitol Hill… right??? Right? Please??? Somebody?! This is a huge problem as the clinical practice is but once facet of the bigger picture; a bigger picture that includes things like business administration, marketing, healthcare administration, corporate compliance, human resources, billing, accounting, finance, business development, company culture, legislative and political advocacy, public relations, systems building, etc. etc. etc. We need to stop thinking as clinicians, and start thinking as a profession. Further on the ownership mindset: There are these weird and terrible myths we still circulate. Thoughts like it takes 5 years of experience before clinicians should think about opening up a practice. Or, that business is bad & corporations are greedy. BUSINESS isn’t bad. Bad business, is bad. If we continue to ignore all the other various facets of professional practice, we will only continue to pigeon hole ourselves as replaceable technicians. Competitive advantages don’t come from comfortable situations. Sadly, one of the highlighted “benefits” of the Physical Therapy profession as well as the Rehab Therapy Allied Industry at large… is that it’s comfortable! At WORST: You will always have a comfortable, recession proof, average middle-class American job and lifestyle. I don’t know about you… but, for me… with the amount of training, sweat, blood, tears… oh, and of course… the aforementioned #1 thing we can no longer ignore… THE DEBT… “average.” is no where near good enough. Average comfort is not good enough for me, for my profession, for my colleagues, for my stakeholders, for the patients we serve… it’s not good enough for a health-stricken society that NEEDS US to step up and be the doctors they deserve… the doctors we are supposed to be. Comfort has left our feet, stuck in the mud, because all we’ve done is let rain water gather around us whilst we failed to prepare our crops for the coming seasons. And, while not taking any credit nor due recognition away from those who continue to fight for us, lead us, pioneer, suffer, and otherwise put themselves out there for public critique — we’re not talking about those already sacrificially leading the way on the bleeding edge….. we’re talking about our entire profession en masse. We need to stop being, feeling, and aiming to be comfortable. We need to get comfortable being UNCOMFORTABLE. I know, I know… I’m just so positive on a usual day. This is a rather aggressive post for someone like me. Well, sometimes you have to draw a line and take a stand… sometimes, you can’t just promote what you love. SOMETIMES, there are barriers that get in the way. And, as much as I’m known as an advocate for building bridges, sometimes you have to knock down a few barriers first, before you can make meaningful progress in making those connective crossways.